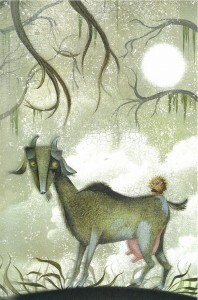 If you are an admirer of quirky illustration, and you’ve never heard of Lane Smith, then clearly, you don’t know Jack. If you collect beautiful picture books, and The Very Persistent Gappers of Frip is not part of your collection, your collection doesn’t know Jack. And if you own a goat, and you’ve never checked them for gappers, not even once, then forget about Jack, you need to know Capable, the spiky-haired, brighter than bright heroine of this strange and deceptively brilliant story. 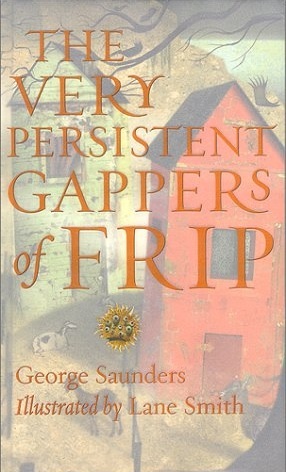 The Very Persistent Gappers of Frip is an inspired collaboration between two artists at the peak of their excellence and eccentricity: George Saunders, humourist & short story fabulist, and Lane Smith, visual maverick & current focus of my deepest jealousy. The writing, illustration, design, and ideas expressed in this book elevate it beyond the usual children’s picture book fare, and even beyond the unusual. It’s a true gem. Frip is a town of three tall shacks overlooking the sea. Each house has a goat yard, an assortment of goats, and a raging infestation of the oddest sort~a plague of gappers; barely sentient, urchin-like burrs with multiple eyes, and a passionate, obsessive love for goats. When they attach themselves to a goat, gappers emit a ‘continual high-pitched happy shriek of pleasure‘, disturbing the goats to the point that they no longer give milk. As the l ocal three-house economy is based on selling goat milk and goat milk accessories, this is a problem. But why deal with the problem when you can treat the symptom? For many generations, it has been the job of Frip’s children to pluck the gappers from the goats, and empty their gapper-sacks into the sea eight times a day, month after month, year after year. And of course, being very persistent, as the title suggests, the gappers return to their unconventional objects of affection almost as quickly as the children can remove them. Needless to say, the kids are not alright…they are exhausted. Which brings us to Capable, a young girl who not only has to deal with gapper-ridden goats, but also her grief-ridden father who has yet to recover from the death of Capable’s mother one year ago. He is so stuck, in fact, Capable must paint all his food white, the colour of rice, the last food his wife ever cooked. Capable suggests that they move away from Frip and from the gappers, but her father insists on staying. There is a bit of Dickens in Capable’s backstory, but in Saunder’s hands, it is never morose, just matter of fact honest…and cheeky. Capable is determined to break through the town’s and her own father’s insularity. Most of all, she would like to sleep. A genetically mutated, and slightly ‘less stupid’ gapper, sporting a protuding lump on the side of its head that is a ‘somewhat larger than average brain‘, notices that Capable’s house is a bit closer to the sea than the next closest house, so he instructs his gapper-kin to only attach themselves to Capable’s goats. After all, ‘when you’re the size of a baseball and have no legs and move around by crinkling and uncrinkling your extremely sensitive belly‘, extra exertion is something to be avoided. But man, think of those abs! Did I say this was written for children? 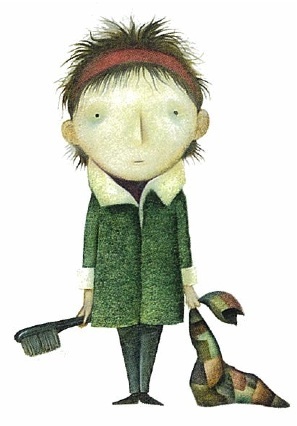 Three words describe the art of The Very Persistent Gappers of Frip: I love Lane Smith. OK, that’s four, but I’m prone to overstatement. Lane Smith, aka The Stinky Cheese Man, is the illustrator of such classics as Squids Will Be Squids, The Time Warp Trio, Spooky ABC, and my personal favourite (other than Gappers), The True Story of the Three Little Pigs. Often working in collaboration with John Scieszka, the pair revolutionized children’s pictures books in the way Roald Dahl revolutionized children’s fiction in the 60’s, by introducing a level of social satire and subversive humour to the genre that helped shape an entire generation of children, and entertain those without children who appreciate that sort of thing. In particular, Lane Smith has brought an entirely original visual style to the table, one that has been hugely influential. 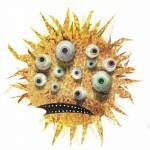 It’s a kind of cubist/collage sensibility in combination with breathtaking artistry, and a wicked sense of humour. Mr Smith is truly an extraordinary illustrator. As I was re-reading Gappers last week, I placed sticky-notes on every page with a great line or thought, and by the end of the book, it looks like a sticky-note dispenser. George Saunders worked as a geophysical engineer before entering a master’s in creative writing program at Syracuse University, which he’d read about in People Magazine (or so his website notes.) He was the recipient of a MacArthur Fellowship, otherwise known as a ‘genius grant’, in 2006. If Saunders was a gapper, he’d definitely be the one with the brain protrusion on the side of his head, and the goats would be singing to him. His words have the effortlessness of a cat in repose, and the charm and freshness of a mango & lime salad with just the tiniest hit of cilantro. Perhaps I should not compare great writing with food, but a perfect mango & lime salad (with just the tiniest hit of cilantro) is a delight to the tastebuds and to my olfactory senses, in the same way Saunders words delight my brain. 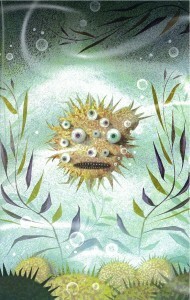 In combinaton with Lane Smith’s gorgeous illustrations, The Very Persistent Gappers of Frip is pretty much a perfect picture book, although at 84 pages, it is more of a perfect novella. A parable of the Golden Rule. A hilarious satire of society. A tale of selfishness, self-reliance, and goats. One Comment for "Mr Smith Goes to Frip"